Farmers will have fresh, local summer produce available sooner than ever this spring, thanks to technology that can add several weeks to growing seasons. 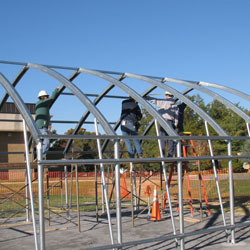 Eustace is among hundreds of Virginia vegetable producers taking advantage of plastic covered tunnel structures known as hoop houses or high tunnels. “Basically it can add 30 days to the season both at the beginning and the end. The earliest I’ve had ripe tomatoes is June 18, but it’s possible to have them as early as mid-May in some parts of Virginia. And I’ve still had fresh tomatoes into December,” he noted. To learn more about how hoop houses work, visit pubs.ext.vt.edu/content/dam/pubs_ext_vt_edu/AREC/AREC-50/AREC-50_pdf.pdf.